ISLAMABAD, (UrduPoint / Pakistan Point News - 17th Apr, 2019 ) :Medical expert on Wednesday called for creating awareness on "World Hemophilia Day" as there was an urgent need to make people aware about this disease so that children suffering from it could be properly treated and could live a normal life. Talking to ptv news channel in connection of World Hemophilia Day 2019, CEO Fatimid Foundation Dr Waleed Bin Azhar said, "Hemophilia is a genetically transferred disease due to deficiency of factors VIII & IX which are responsible for clotting of the blood". Most of the patients got bleeding even after getting minor injuries specially blood collected internally over the joint which leads into swelling, pain various joints of the body and make them disabled, he explained. Dr Azhar said death ratio in patients with hemophilia disease is low as compared to thalassemia patients. There are two types of diseases like hemophilia A and hemophilia B, he said adding that the disease can transform into boy babies from their mothers. He said hemophilia patients should be given proper attention and sympathetic consideration in providing them treatment facilities, physiotherapy and rehabilitation. Dr Waleed said there was dire need to work on all diseases prevention strategies throughout the country. He also said research on genes therapy is underway which will help to control bleeding in hemophilia patients. After completion of clinical trial, we will be able to treat the thalassemia and hemophilia patients in near future, he hoped. 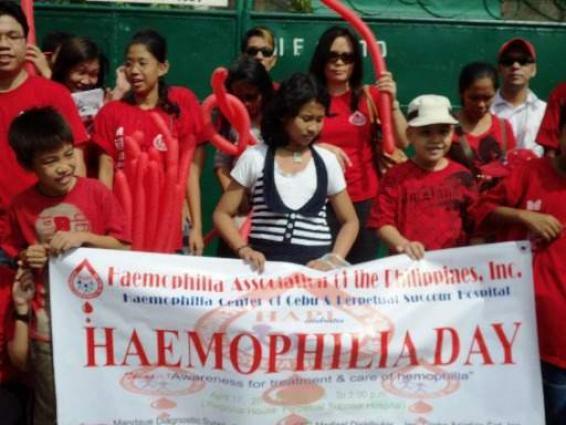 The day is observed annually by the World Federation of Haemophilia (WFH) with different themes to create awareness, he mentioned. Specialist said, Haemophilia occurs due to defective genes and currently there is no cure for the condition. Excessive bleeding from cuts, injuries, pain joint swelling, nose bleeds are some signs of hemophilia. Replacement therapy, demand therapy, prophylactic therapy, pain relievers, physiotherapy are some medical options that can provide relief to affected people, he added. He further said people were also affected due to social stigma and lack of understanding among others, adds, there is a major lack of awareness in Pakistan. Parents are able to help their children better when they understand the effects of hemophilia, he suggested. Due to ignorance most people tend to discriminate against those with Hemophilia. The physical stress of this medical condition and the mental trauma due to stigma make lives challenging for people with hemophilia and their families, Dr said.